Books are a unique way to present your artwork to the world. They are portable portfolios of what you've created that will last for generations. 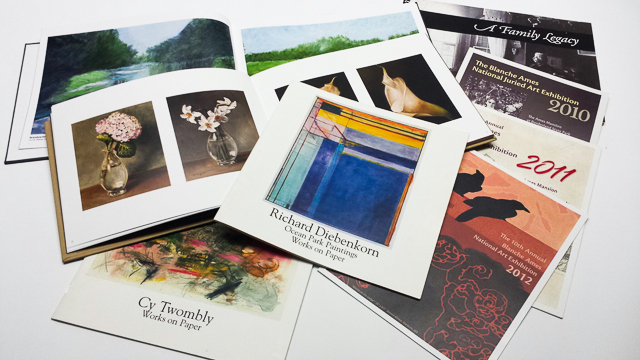 They are also a great sales tool - a calalog to encourage sales of your orginal art. They are also an important part of your legacy. Although there are online services for creating books, what we offer are a team of excellent designers; custom bookbinding by the oldest and most experienced bookbinery in the country; the ability to digitally photograph paintings, sculpture or other fine art in our studio or on location; or convert your digital files, film or transparencies to a format for publishing. Since our specialty is art and art reproduction, we're color experts. We're also excellent at retouching and can digitally repair very old or damaged works of art. We can print on a variety of normal or heavy papers and the choices for your book cover are endless. Slip covers are standard and offer a place to feature a color image of your art. Editions as small as 100 or less are possible but you can make as many books as you want. When you bring your book project here, we'll take care of the details and work with you to get exactly what you want in your book. If this interests you, please give us a call for a consultation.